Online videos of interviews and presentations included in this section focus on sustainable communities, land use, city planning and design, ecological cities, revitalizing cities, smart growth and urban change. 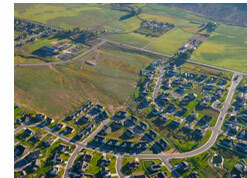 Topics include land use law and planning, regional planning, planning land use and transportation together, and protection of ranchland and farmland on the urban edge. Specific issues include planning and designing livable cities, the ecocity concept of designing ecologically sound (green) cities, dealing with flight to the suburbs, and the new urbanism movement. This section also includes videos that discuss growth management, sustainable community economic development, responsible land use and transportation policies, and the importance of city design in addressing climate change.